The prices for main precious metals varied in Azerbaijan on July 6, according to the data published by the country’s Central Bank. 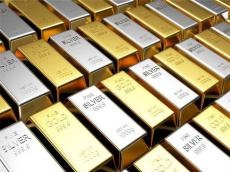 The cost of gold increased by 0.085 manats to 2133.8825 manats per ounce in Azerbaijan compared to the price on July 5. The cost of platinum increased by 5.1425 manats to 1434.8255 manats. The cost of silver decreased by 0.0451 manats to 27.2283 manats per ounce. And the cost of palladium decreased by 0.0425 manats to 1615.2125 manats in the country.